Hello again, I've started another pattern, this one for my youngest daughter. It is Citrine, by Anderson. I have a question and I'm hoping someone can help me out. This pattern calls for Kreinik #4 (it says dmc 032) and B5200. I bought S5200, but I'm not sure that will cut it. 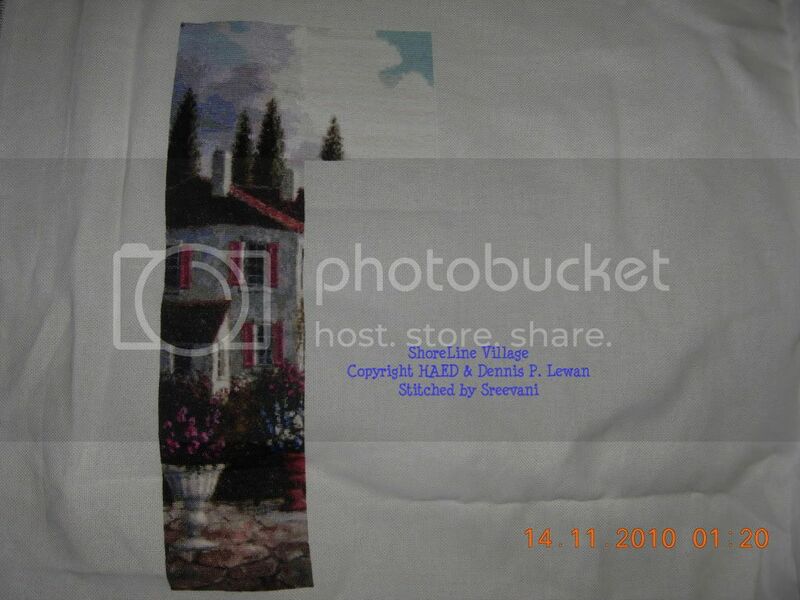 If someone knows what I can convert these threads to, that I can buy from Michaels or Hobby Lobby I would really appreciate it, I would prefer not to order online unless I absolutely have to. 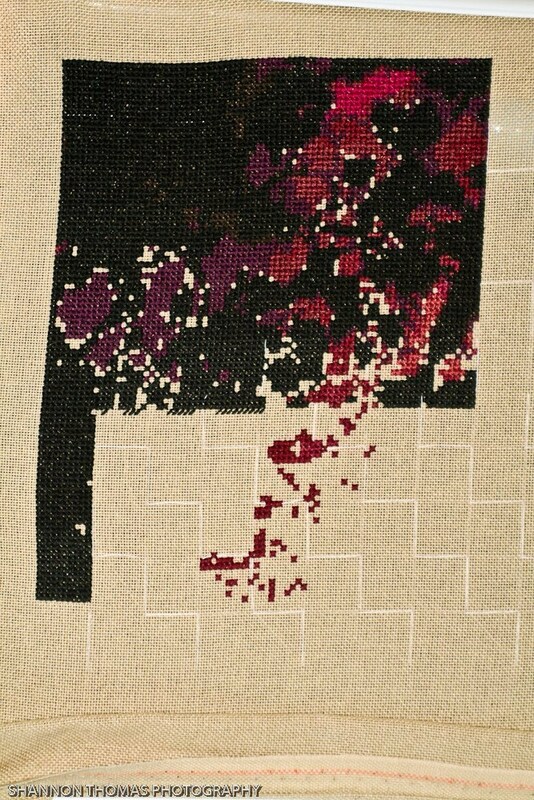 The pattern is done on 28 count evenweave, 1 over 1. I will try to post a picture sometime in the next couple weeks. Well after a bit of a break finishing off all my UFO's. I am finally back working on just 2 projects and they are both "Sins" which I'm very excited about. When I stopped working on them I had done part pages on both. So I picked up "Envy" to finish the bottom row. Everyone's Work is Looking great! Well, I did it! I completerd my crazy challenge to get Logan finished in under a month so he could be submitted to the reward program...... well he's finished and has been sent off to Michele at HAED! This time last night I really didn't think I'd get the job done as you can tell by how much was left to do in the first photo below which was taken just before bed last night.... but here he is finished and in all his glory! I started stitching at 9am this morning and have been stitching solidly all day until just after 10pm tonight but I think it was worth it! I'm so proud of how he came out and now I have my fingers crossed hoping for the swift arrival of Meredith Dillman's QS Emerald Dragon but in the meantime it's back to Faerie Melody for a while!! The knight is finally complete! Next up, some background, and then the butterflies, I think. 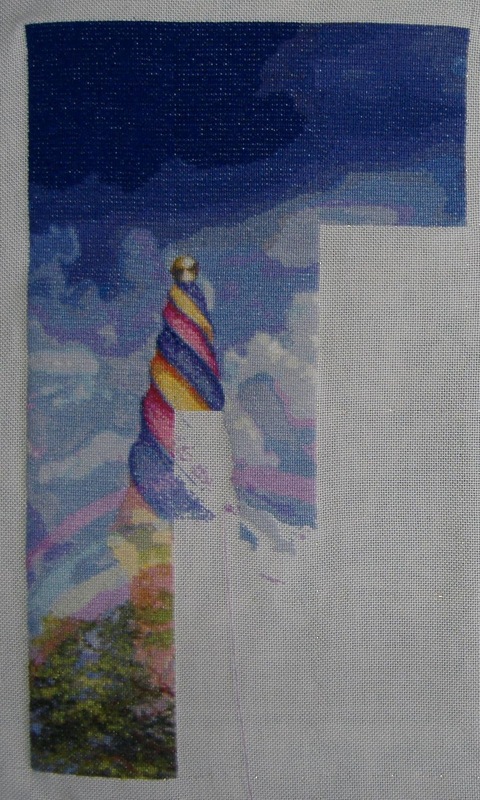 With Gaudí I've finally finished this portion of the sky, and worked a little more on the tower, another 4 or 5 weeks, and this page is done as well! 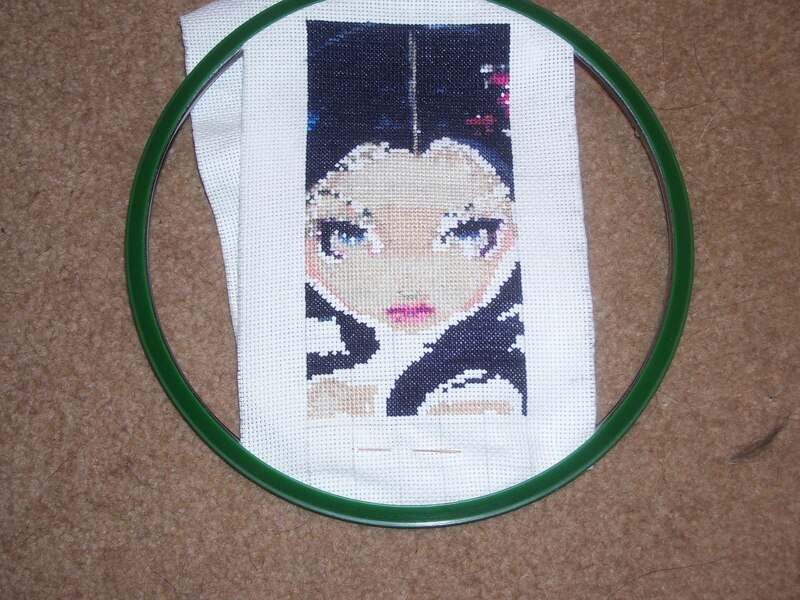 Both are stitched in 18 count aida and are 2 over 1 full cross stitch. I reached the bottum of the work. 580 stitches high. its on 18 ct aida. 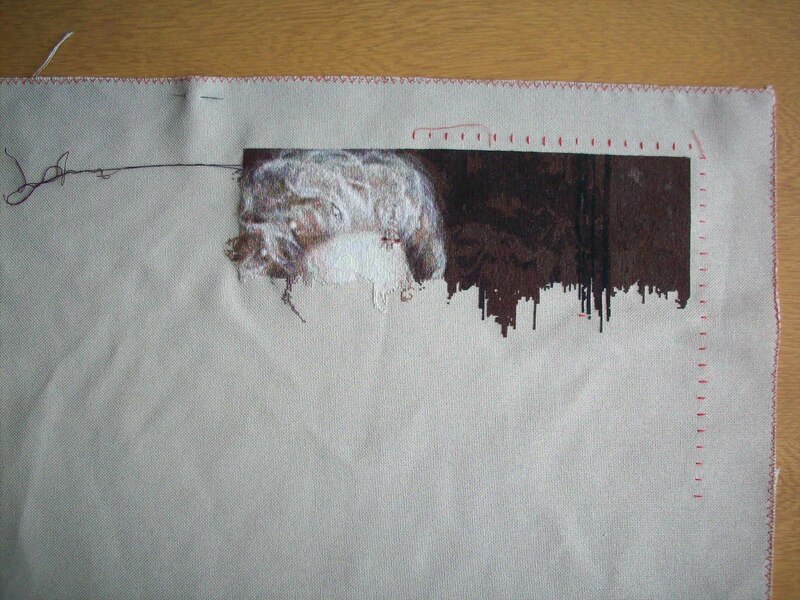 Now in February I am starting The First Rose from Christensen. The preperations were already done. For this I use my framestanderd. I do her without the background. nevertheless its a large project. Here is my WIP Bubbles by Selina Fenech. I am on page 3 of 42. 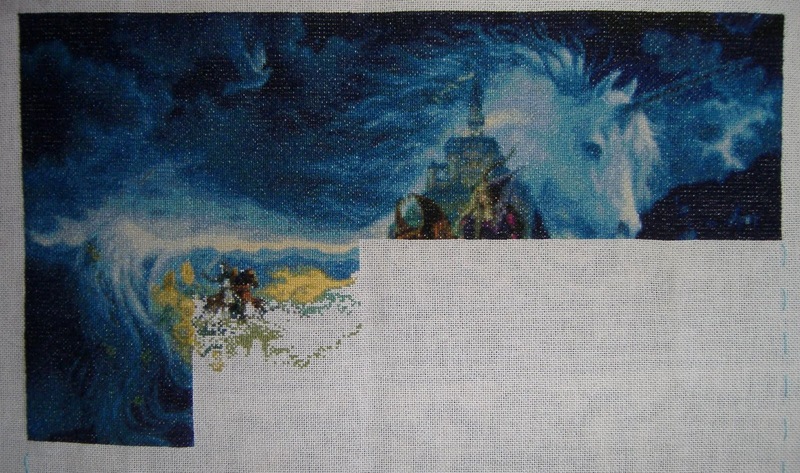 It is going very slow because of so many confetti stitches. Hope you like it. I have a request from a stitcher looking for Matt Stewart's Eternal Promise. This has been cleared through Michele. She is, of course, looking to purchase it, not copy or trade it. If you have the chart and would like to sell it, please send me an email, and I will hook you up. Here's the latest update on Storykeep Logan!! Page 2 is all done and the partial page 3 is started... dunno if I'm going to get him done by the end of the month but I'm sure going to try!! There's not so much sparklies on this page so hopefully it'll go much quicker. 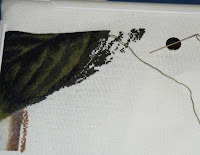 I've decided not to use DMC B5200 again for HAED peices as like Kreinik it frays far to easily. 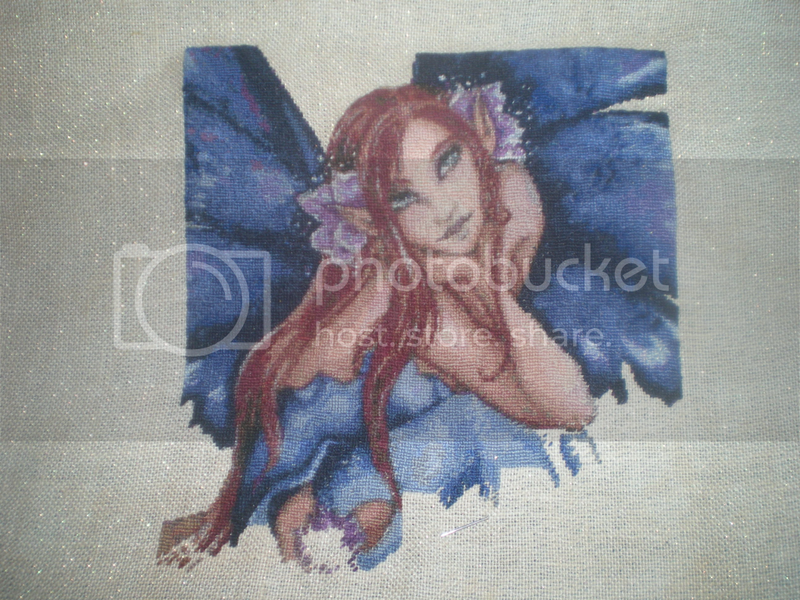 I bought some Sulky 02776 pearlescent thread from my local Hobbycraft and on test stitching with it using 2 strands it stitches up much better and much more easily so I'm going to give it a try on the next HAED pice that requires a pearly thread! Let me know if you have any thoughts any suggestions? 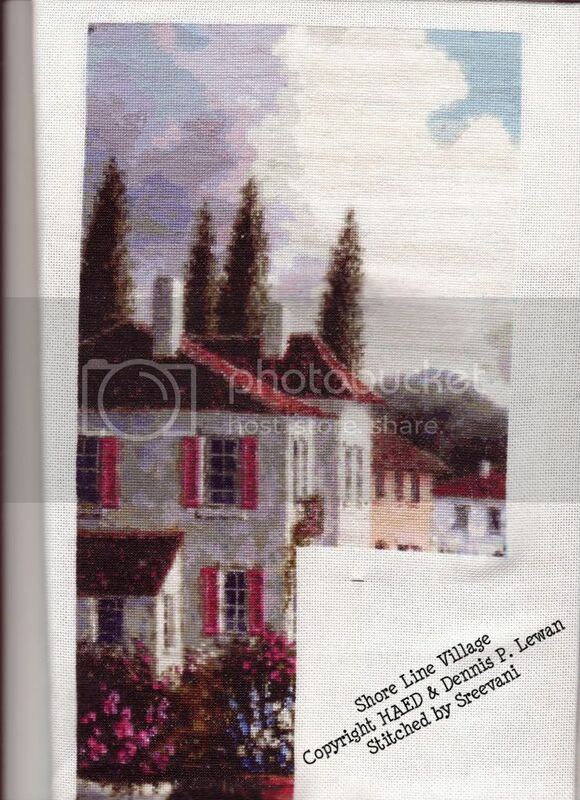 Here's an update from my buddy Vani on her Shore Line Village!! And here is the latest page I just finished! 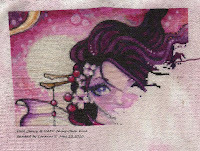 Queen of Hearts - Mel "Romantic Fool"
I have successfully completed 2 pages of Queen of Hearts. I am so enjoying this project! 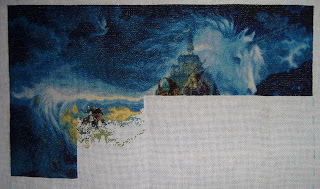 I've put it aside for just a little while so I can work on some other projects though. But I will get back to it very soon! You can see in the bottom right corner the start of one of her wings. And the blobs are actually becoming images! 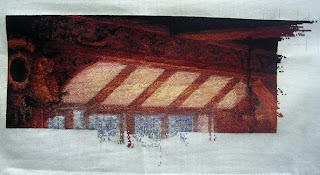 My name is Sam and I have been stitching since I was 14 (I am no 31). I discovered HAEDs about a year ago and I now class myself as an addict. I have bought (too many) charts and I currently have 2 WIP. 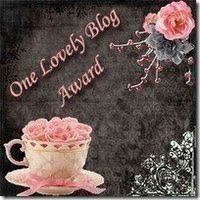 The first I started is Queen of Hearts by R. Anderson. I have completed 4 pages of this. 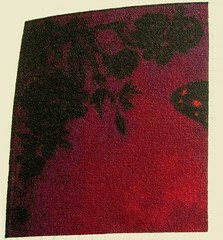 More recently I have been almost exclusively working on Millennium Tree by J. Wall. I have completed 4 pages of this one also. I plan to auction this one off for charity when its completed to raise awareness of global warming and the human impact on our planet. 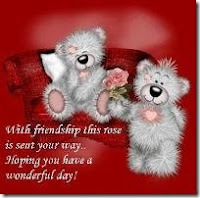 Happy stitching everyone and keep up the great work!! Hi Everyone, I'm Kim and my buddy Susan is kindly posting for me, I've promised her that I'm not going to be to much of a hassle because with other projects on the go at once I'm only going to be updating once (twice if I'm really lucky) a month. This is my first ever HAED and I'm quite excited, but also a little nervous about it. It Lancelot and Guinevere by Selena Fenech, stitched on 25 count evenweave (which is absolutely tiny by the way). I was a little intimidated when I started but I'm really enjoying it now, now that the initial terror has worn off. It's also the first time in a long time that I haven't used gridding so I'm having to really concentrate on my counting. I normally use that funky red twine that I've forgotten the name of, but thought that would be to tight in 25 count, and the fabric pen that I bought was horrible, it wore off in less than 2 hours and left a slight mark so I fell out with it, especially as it was a biro and really difficult to apply, but anyway. It doesn't look like much yet, but it's the beginning of a window. 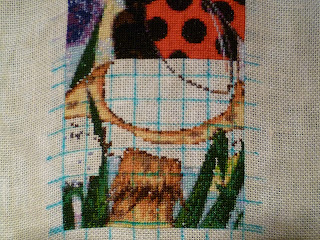 I always stitch the most boring part first, so that I've got the fun bits to look forward to, weird but true! 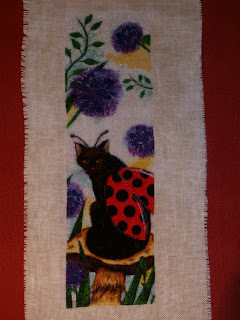 Loving my stitching, and all excited about being allowed to post here through the generosity of Susan. Happy stitching everyone, and I'm loving seeing your progress as well. 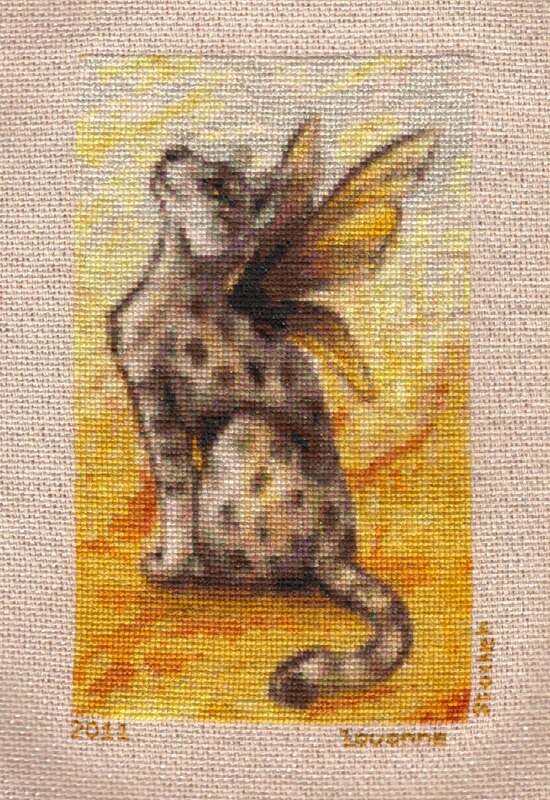 TT Sun Worshipper Cat 3 - Complete! I recently replied to a post on the BB about the wips we all have on the go. It was in writing my reply there that I realized that I had 11 HAEDs going. ELEVEN! That's just HAEDs, not counting any other little wips I have started over the years in my madness. Granted, 5 of those 11 are SALs that I signed up for on the BB, Lord knows I can't miss out on any of those. But it brought me to the realization that I must finish some of these. The most logical thing to do is finish off the ones that are BB SALs, since they are smaller in size, therefore they should be the easiest and closest to their finishes. Also, I didn't finish a single thing in 2010! Not one! So I am in desperate need of getting a few of these finished, my wip bins are taking over my house! ;-) So here's my first finish of the year! 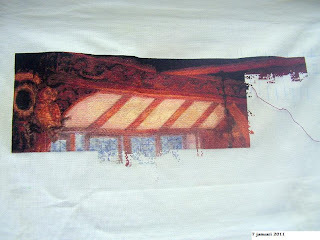 I will be focusing on the projects that look like they are closest to the finish line for the foreseeable future. You will see a lot of small pieces coming out of the woodwork, and hopefully some more finishes soon!!!! 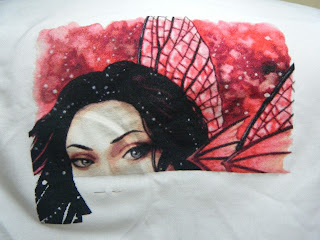 Here is an update on Dragonfly. 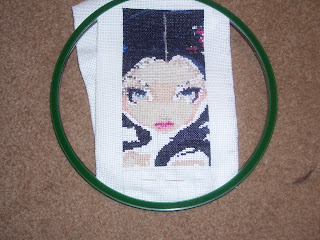 All I've stitched this week is 310 and there is plenty more to come and her hair continues to grow. 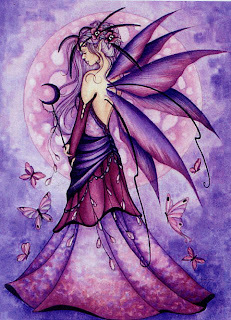 Here is another update of QS Nice Faery by Amy Brown. 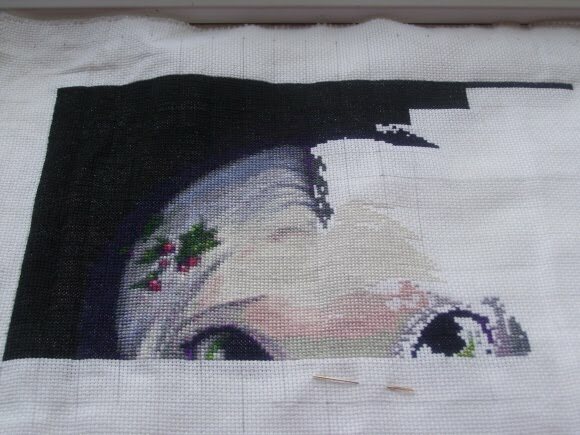 I was hoping to finish her by Christmas but have been having trouble making much progress on her because I am working over one on 32 count linen. I am surprised on how much I actually got finished on it. I know I've been MIA for quite some time. Some of you may remember that my boyfriend was in a bad car accident last April. He is actually still in the hospital. We've been trying to get him into rehab but everyone says he is still not ready. He is awake now and does remember everything before the accident, but he cannot talk and mostly communicates by nodding his head yes and no. So I have not stitched hardly at all since then, but picked it up last weekend so I will be back on here with an update soon. I'm just now catching up on all of the great progress! Glad to see so much activity on here! 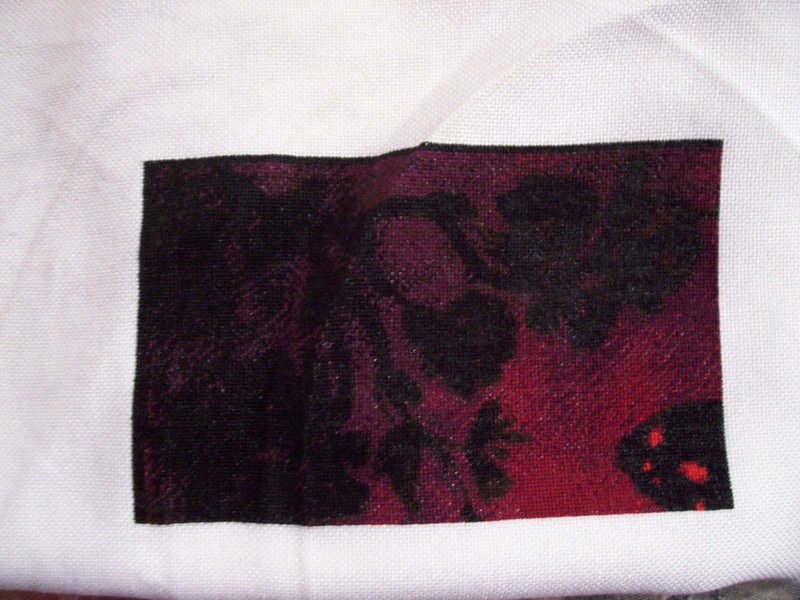 And I've made a tiny start on QS Rapture (Marc Potts) for the HAED BB SAL. 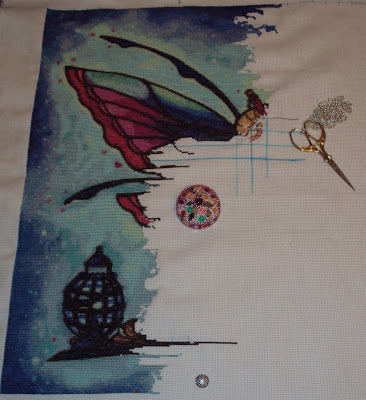 My Progress On Lavender Moon! I have stitched 108 stitches today on Lavender Moon! Since this is my first HAED it looks like nothing! 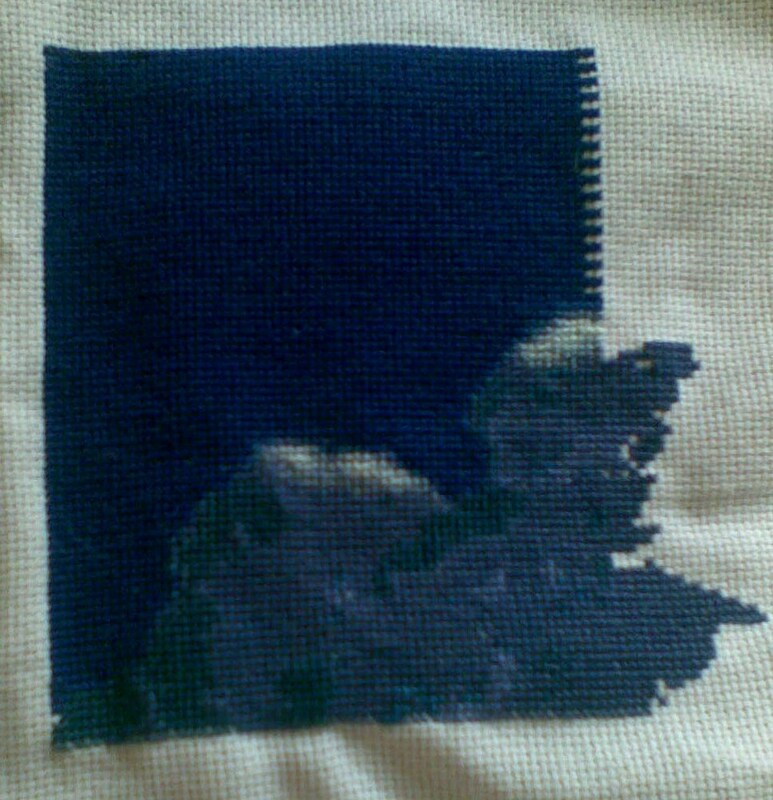 I am stitching on 25 ct Lavender Bliss 1 over 1 so I guess that accounts for this small blob. I started in the upper left corner which I never did before either. I have always started in the middle. Well, here is a pic of the pattern followed by my start. Present this project started a year ago and fell in love the very sight of him, is Hanna and I love Disney! 16 Steps facts but I only teach you the latest! 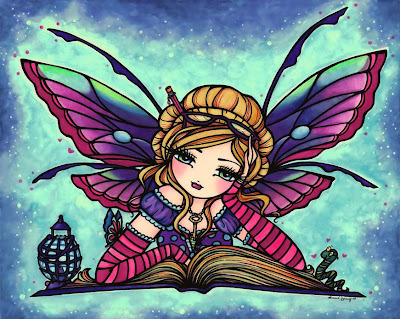 Here's my Storykeep Logan by Carrie Hawks..... Page 1 is done!! I managed to get the final bit done today to finish this page which was a nightmare due to all the sparklies, almost the whole of the background was done in DMC B5200 ( I hate Kreinik!!) but I think it was worth it!! As of this morning.... almost done! 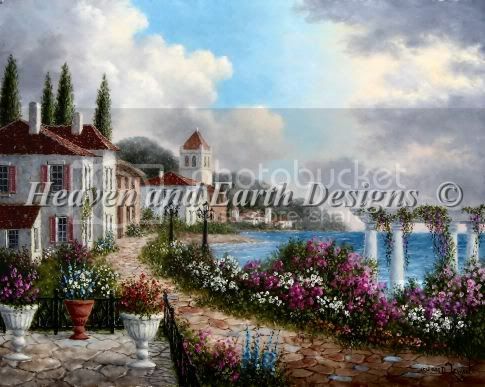 Here is my HAED Nature’s Mourning. Unfortunately I did not write down the fabric count. It is a mocha evenweave. 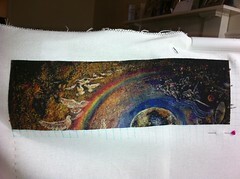 I am stitching 2 over 2. LOVE seeing all the work being done! Wanted to first say that everyone's pieces are coming along SO nicely!! 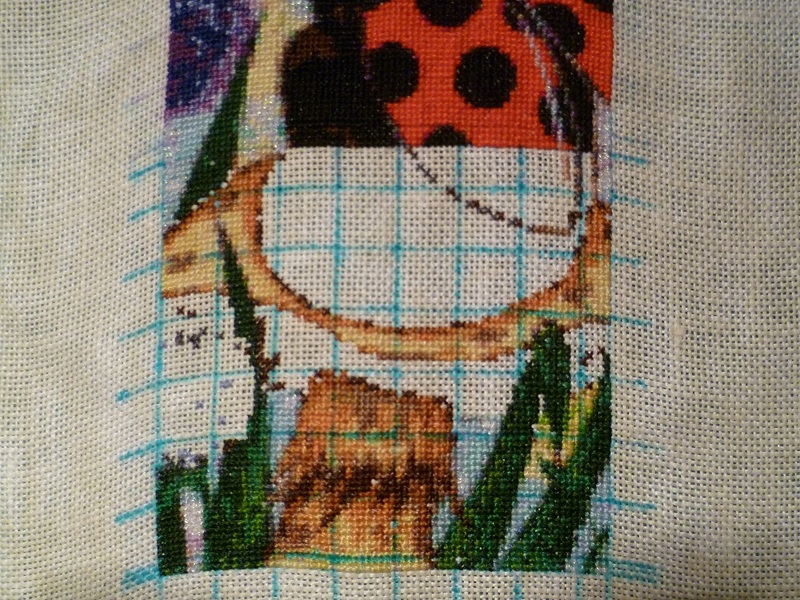 I just got back to stitching this past week after a 2 year loss of xstitching mojo. Glad to be amongst the xstitching world again! Now, I have a question. I see that a lot of you grid your pieces. I have The Story Keeper going (need to find it to start working on it again since I moved) and I didn't grid. 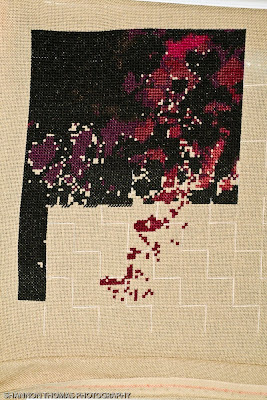 But I am working 20 x 20 squares when I work on it. 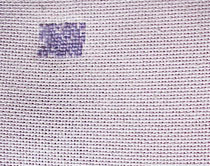 When you grid, do you use thread or do you use fabric marker that comes out in the wash? And, do you wash your pieces after you stitch them to get it out? I think I would be afraid to wash my piece. LOL I'm always very careful to wash my hands before I stitch and keep my pieces in a container so they don't get dirty. Anywhoot... I'd love to hear from you all on this. hello friends, and again 1461 stitches further snow white, you can hardly see but a stitch is a stitch;) is a little progress but I do not give up! I do not know when but someday ..... I will have it finished! 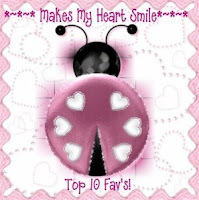 I always enjoy looking at your beautiful projects, you all do great work! 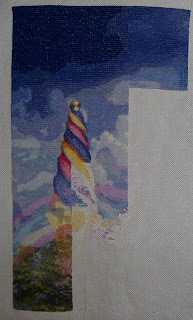 However I'm really breezing through Gaudí's clouds, the only slow part will be the tower. I haven't picked this up since July of last year. This is where I started on January 1. I finished page 3 and am now starting on page 4. I am now actively working on these two designs. I especially love to work on Creativity. The colors are wonderful. 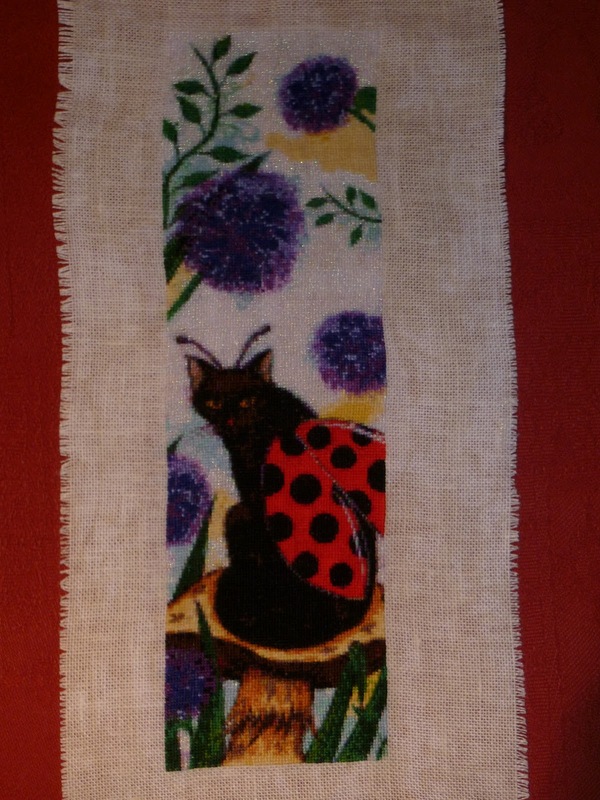 Both are stitched 1 over 1on 25 count, so it is not going very fast, but I think the result is really beautiful. Well, I Have Started Lavender Moon!! !